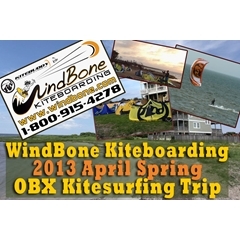 WindBone Kiteboarding's 2013 Annual Spring Hatteras OBX Kitesurfing Trip has been booked and we're taking reservations with spots currently available. Trip Dates are First Week of April 2013 -(03/30/2013 to 04/06/2013). Come with us to experience the magic of Hatteras and the Outerbanks (OBX) of North Carolina -a true Kiter's paradise.. Book now to lock in your spot..
..and when we say kite, we're talking absolutely perfect conditions -miles and miles of flat shallow water and clean winds literally at your back door.. and also miles of ocean coastline across the street a couple blocks away.. These perfect conditions of Hatteras make for an ideal environment to come down and learn the sport, dial in your riding, progress to the next level, master new tricks, etc -perfect conditions bring perfect results, and focusing on kiting for 1 week straight in perfect conditions can equal a season or two in the real world for those with busy schedules and uncooperative winds..
..and when we say house/accommodations, we're talking a mini-mansion, modern/clean house with three floors, game room, hot tub, entertainment room, etc..
We also will have lots of demo gear to try and ride during your stay.. we'll have a mix of the latest 2013 Gear from RRD, CrazyFly, Epic, Litewave, Mystic, Boardworks SUP, and more -free demos included with trip price..
A small powered boat will also be available on site for support, lost board pick-ups, rescues, lessons, etc..
Hatteras, Outerbanks (OBX), North Carolina is a renowned Kiteboarding Destination located on a narrow stretch of land/island surrounded with water and many miles of prime kiting ..known for miles and miles of shallow water and slicks on the sound side and miles of renowned surf conditions on Oceanside..
-The Latest 2013 Demo Gear to try from RRD, Crazyfly, Epic, Boardworks, Litewave, Mystic, and more..
-Small powered boat available on site at house for support, lost board pick-ups, rescues, lessons, etc..
Mixed shared options, single beds, bunks, etc..
**Custom lesson, private instruction, and/or or supervised session options and combination's also available upon request.. Contact Us for any requests and special packaged service discounts..
**Lesson options subject to availability -reservations in advance required..
**No Guarantee on wind/weather and respective kitable days --no refunds on any room/stay costs, reservation refunds only available if canceling no less than 20-days in advance of trip date.. any lessons not completed will be refunded or pro-rated based on portion completed..
**Any Kiter Not Demonstrating Safe Practices, Not Possessing Basic Kiting Knowledge/Experience, or any behavior deemed to be unsafe or inappropriate will be either banned from Kiting, forced to take lessons in order to continue kiting, evicted from house/stay, forfeit any fees/costs paid, and/or all the above..
**No Smoking anywhere inside house, rooms, etc..
**Every individual must clean up after themselves, and be respectful of other house guests, etc..
**Each Individual is responsible for any/all damages caused..
**WindBone Kiteboarding and/or any related and authorized parties reserves the right to ban and/or evict any individual for any behavior deemed unsafe and/or inappropriate at any time, and forfeiture of any moneys paid will ensue..
**Purchase of reservation, room, and/or any services related to this trip constitutes agreement to the terms above and is a binding contract..
-Basic Sun Protection, Sunscreen, Sunglasses, rash guards, etc..
-No Food or Drinks Provided, can purchase std items at local supermarket, and will organize trips to go out to eat, chip in for group meals, etc..
Stock/Availability May Vary at times on certain Kites/Boards/Items, every effort will be made to get your order shipped out ASAP --prompt contact will be made if any availability or ship lead time issues arise.. Feel free to Contact Us with any questions..
Also, please Contact Us for all your RRD, Epic, HQ, Mystic, Bravo Elec Kite Pump, Trainers, Lessons, and General Kitesurfing needs -if you don't see it just ask.. (some closeout 2009/2010/2011 gear currently available).. Extensive Demos also available in the NJ/NY/PA-Metro area (RRD & Epic Demo Test Center).. The sport of Kiteboading can be extremely hazardous/dangerous without proper instruction/experience --those new to the sport please seek professional instruction prior to engaging in the use of kitesurfing equipment..
April 2013 Spring Hatteras OBX Kitesurfing Trip with WindBone Kiteboarding your RRD, Crazyfly, & Epic Specialists..